Your baby's sensory development is exploding! Their brain is designating specialized areas for smell, taste, hearing, vision, and touch. Some research suggests that they may be able to hear your voice now, so don't be shy about reading aloud, talking to them, or singing a happy tune if the mood strikes you. 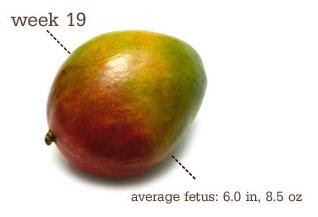 Your baby weighs about 8 1/2 ounces and measures 6 inches, head to bottom — about the size of a large heirloom tomato. Their arms and legs are in the right proportions to each other and the rest of their body now. Their kidneys continue to make urine and the hair on their scalp is sprouting. A waxy protective coating called the vernix caseosa is forming on her skin to prevent it from pickling in the amniotic fluid. You look wonderful! This is so exciting. I felt my best where you are right now. Enjoy every minute! 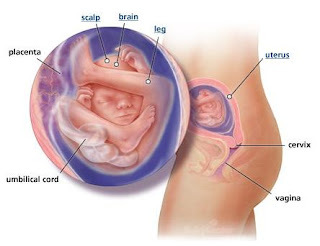 I can't help but think the baby must be uncomfortable with it's leg wrapped around it's head, but then I remembered it's a baby and they are used to being in weird positions. You, on the other hand, look lovely, as always!